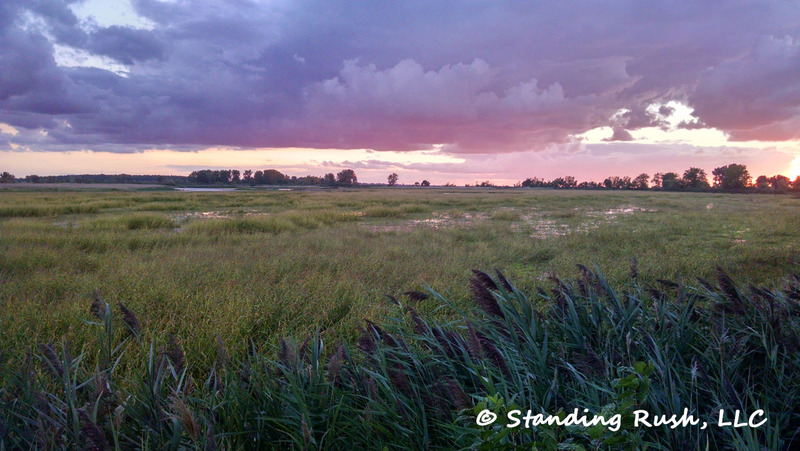 Autumn drawdowns to expose mudflats, not only to attract wading shorebirds to but to provide hints as to best management practices for 2017. 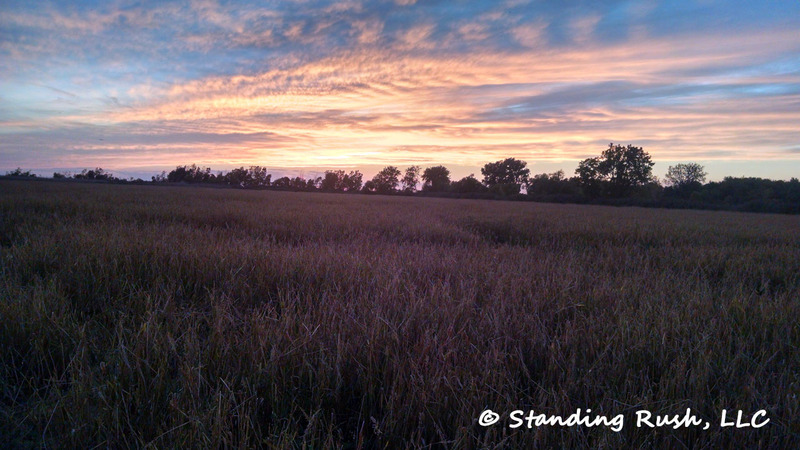 Standing Rush's West Marsh. Newly reconstructed dike visible as light brown ribbon of clay running from foreground toward Sandusky Bay (bay in upper right corner). Flyover also captured 40 acres of millet just to the right of the new dike. The stars aligned in the summer of 2016 such that we could accomplish the single largest earth-moving project needed on the entire property. Before getting into what we did and how it we did it, some historical context is warranted. 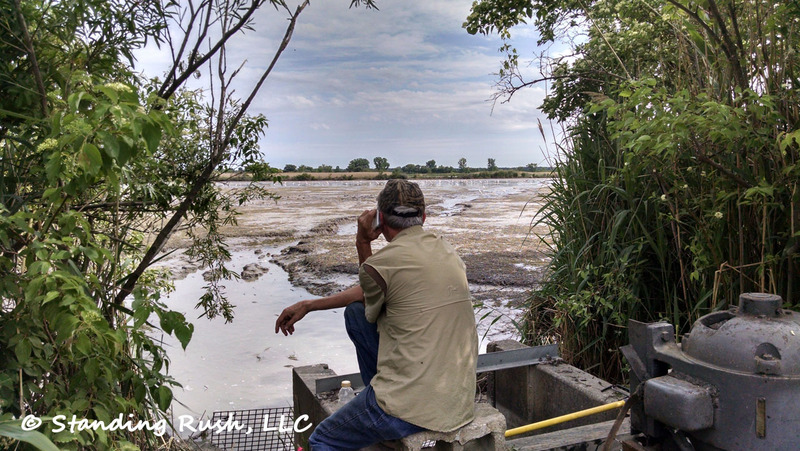 When we took possession of the marsh in February 2015, the site had been “on a respirator” from a management perspective. The previous caretaker was a magician who had kept the site on the map through blood, sweat, tears, and limited financial resources. But because the land was being liquidated as part of a bankruptcy (I know, an ironic term when referring to a marsh!) the previous steward was forced to be hands-off. The pumps were locked out. 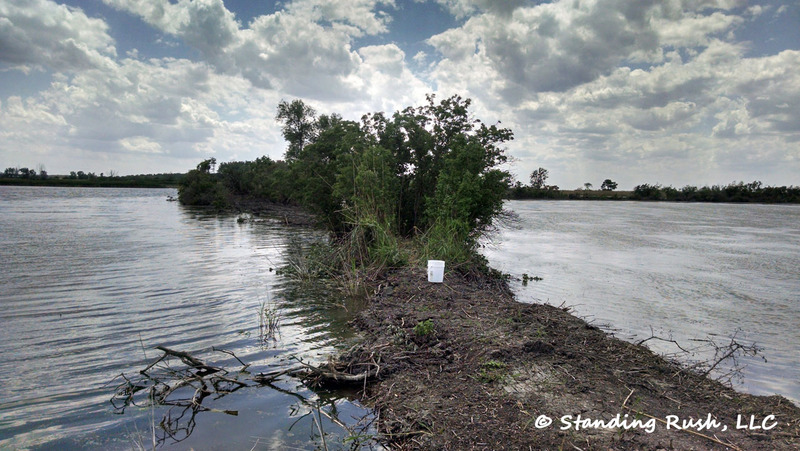 Water levels rose (due to natural accumulations from precipitation), and as a result, vegetative cover emerging from what was shallower water decreased. Meanwhile, the wind continued to blow across growing expanses of open water. 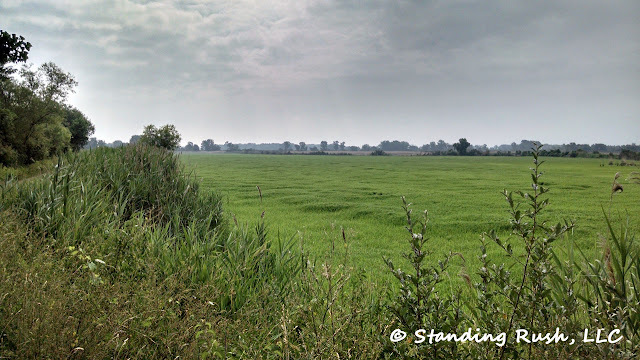 Erosion to the interior earthen infrastructure (i.e., the dikes) accelerated. 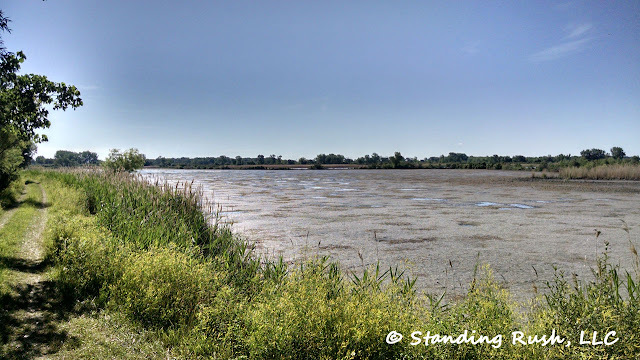 The main West Marsh dike looking northwest, July 2015, extending from the far west end (1) to the far east end (2). Note the visible breach in between, highlighted with an asterisk*. The pump location is highlighted with double asterisk**. When water is pumped out, it flows south to north (bottom to top of image) and into Sandusky Bay. Keeping the water high for those last 12-24 months before the sale of the property wasn’t all bad. Maintaining higher water not only saved money in reduced pumping; the increased water depth also helped stave off the spread of Phragmites and loosestrife. Unfortunately though, by the time we had the pumps back online and the water levels going the other direction, the damage had already been done. An interior dike that was nearly two car lanes wide in the early 1980s was now impossible to traverse on foot. Three discrete breaches had formed and most of the top of the dike had been whittled to a width of eight-feet or less. -- a far cry from the 2-lane levee that it was in into the 1980s. Roy and I quickly recognized that if funds could be secured, this had to be priority one. This earthen levee serves as the means by which the 40-acre management unit closest to the pump (what has historically been called the “Rest Pond”) can be managed discretely from the nearly 150-acre unit to its immediate south (the “Main West Marsh”). Without this divide, it would be nearly impossible to maintain the capacity to achieve desirable and targeted water levels in either area. Again, remember: desirable vegetation is driven by very specific water depths. In order to keep enough water on the furthest reaches south (to minimize the spread of invasives), the Rest Pond had to be kept at full capacity (3-4' deep, on average). So with both units connected as one, the smaller Rest Pond had to essentially be sacrificed for the good of the larger Main Marsh. As recently as spring 2016, the 40-acre Rest Pond was nothing but a relatively sterile, shallow bowl. Water depths ranged from 3-4’. There was no emergent vegetation except for the Phrag that tried to spread into the depths from its margins. Submerged vegetation was limited to relatively sparse stands of curly-leaf pondweed (an invasive). And the water would frequently turn to “chocolate milk” because of all of these factors, combined with a healthy carp population. Suffice it to say, the Rest Pond was not attracting much wildlife. 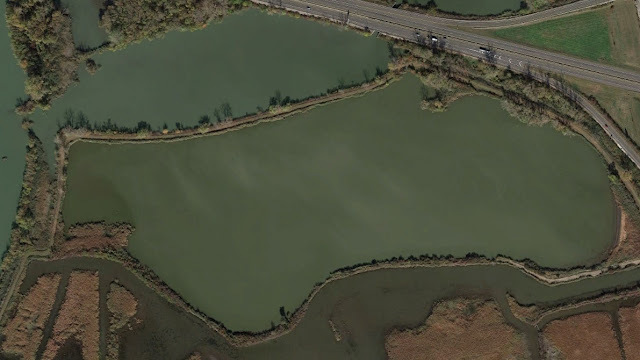 Google Earth screen capture of the Rest Pond taken in October, 2015. Note distinct color variation between open water of the "pond" versus the main marsh at the bottom of the image. 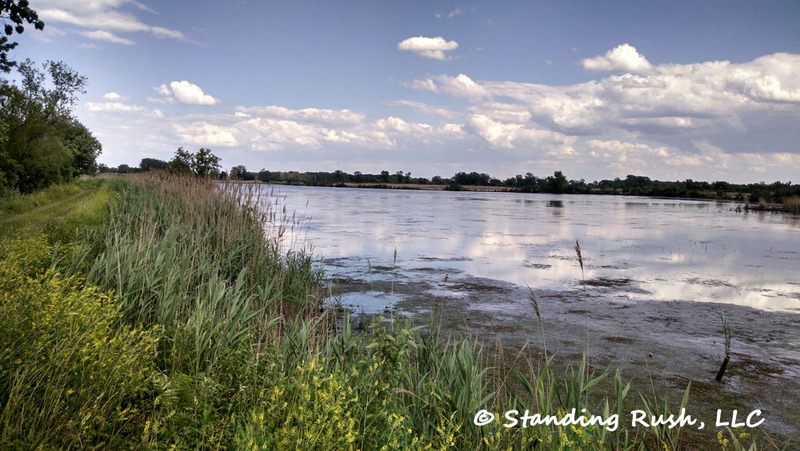 Like the estuary (top) and Sandusky Bay (far left), the Rest Pond is noticeably more turbid (cloudy). Step one in this restoration was securing a nationwide permit through the US Army Corps of Engineers. 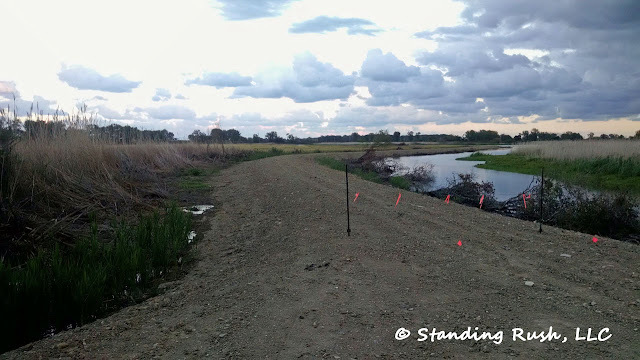 The Corps agreed that this work could fall under a maintenance permit because there was good visual evidence of the dike’s historical presence and broader profile. While the permit took some time, we had it in hand in time to get serious about our next priority: sourcing “clean” clay. Our original estimates suggested that we would need somewhere between 800-1,000 truckloads of clay to rebuild the dike to full capacity. This clay would have to be geotechnically appropriate (in terms of properties such as permeability) and it would need to be free of any elevated levels of contamination. This is where the stars really started to align on this project. As our luck would have it, our neighbors to the immediate north were finally staging to install a much needed and highly anticipated sewer system to replace the failing network of septic tanks that had plagued Bay View and nearby Bay Bridge for years. This is another example of a multi-agency, multi-stakeholder collaboration that took lots of time, patience, and financial resources, but it was just getting off the ground to allow for real improvement as we were setting up shop. The Village would obviously benefit from better utilities, higher tax values, and a new-found prospect for improvements like restaurants and other services that weren’t feasible when septic systems were simply flowing into the open bay. Sandusky Bay benefits from a profound improvement in water quality (think no further than the E. coli levels before vs. after). And in order to make a long story shorter, we benefited from receiving the 1,000 truckloads of “clean” clay we needed for our project, delivered literally to our door – at no cost. and is 15-20 feet high. Turns out 1,000 truckloads of clay is a lot of dirt! It took six weeks to stockpile several thousand cubic yards of clay just south of our field office. 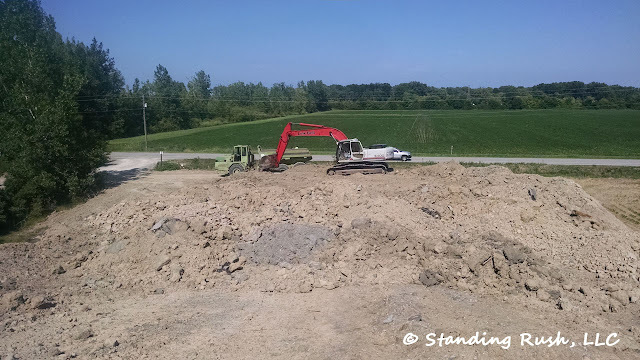 Through collaboration with the Ohio Division of Wildlife’s Private Lands and a seasoned, local contractor, it took under a week to haul and finish-grade the clay in its new location. Despite our good fortune with the clay sourcing, this project would not have gotten off the ground without Private Lands. The State saw the unique opportunity presenting itself and stepped up quickly, efficiently, and meaningfully to lend both technical and financial support. The USFWS Partners for Fish & Wildlife Private Lands Program also contributed to the cause by donating two used but fully functional screw gates. 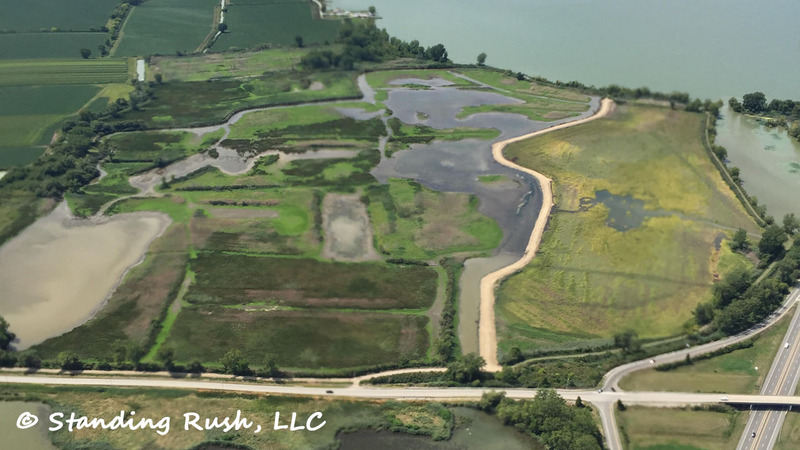 One of these water management structures was installed into the new dike to provide hydrologic connectivity between the Main West Marsh and the Rest Pond. The other was utilized on our East Marsh. 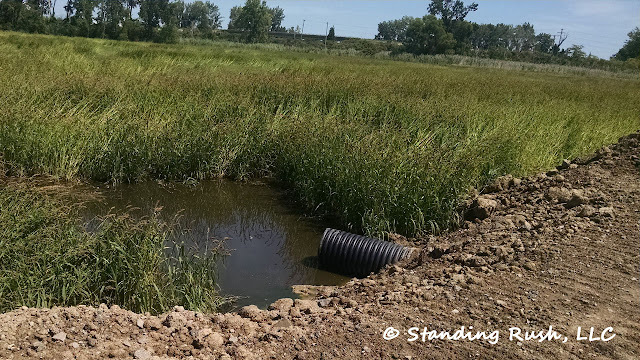 Eventually, we may replace these conduits with open-canopy culverts (to further encourage fish passage), but for now, they are a huge improvement from the open pipes that we inherited with the property. Each Terex off-road truck had to back all the way down 3,000' of winding, unstable dike until the dozer could do its work. Small but mighty. 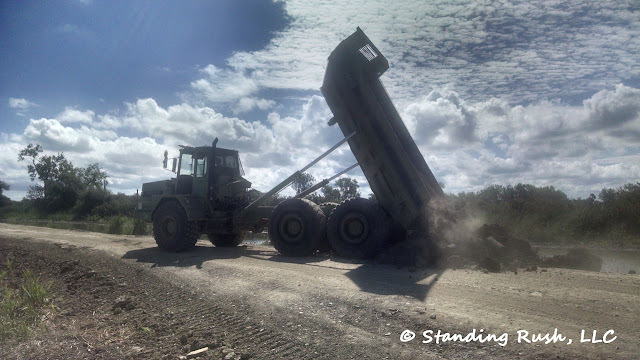 This dozer was working at least 12-hr days for a week in 90+ degree heat and humidity. Finish grade, the newly constructed dike built to agreed-upon specs from the far west end, looking east. Newly seeded, the dike from the far east end, looking west. What was originally estimated to cost $125,000+ was completed for considerably less than half of that sticker price. It was a tremendous step in the right direction for the property and is an incredibly encouraging sign of what can be accomplished when people work together for a common good. To see the final step in the dike rehabilitation project (protection of the asset via strategically placed stone), visit our 2017 projects summary. The recap of the dike reconstruction above glosses over some pretty significant "details" that had to fall into place in order for the earthwork to even be technically feasible. The first order of business was getting a relatively small, 50+ year old pump that hadn't operated in a minimum of a couple years to run -- and run reliably. When we took possession of the property, the single pump that controls the entire West Marsh (almost 200 acres) was perhaps our biggest question mark. We had seen that it would turn on and move water, but we had about 15 seconds of run-time under our belts before we faced the formidable task of drawing down to rebuild the dike just to its south. After some preliminary electrical safety checks and some grease here and oil there, we flipped the switch and started praying. To make a long story shorter, the water flowed through that 10" pump day and night without interruption for about a month . . . the latter half of May and the first half of June 2016. Roy tended to it like a duck on a precious clutch of eggs, but our prayers were answered -- the water was receding in the Rest Pond, and with each passing day, it was dropping faster. Now with literally hundreds of thousands of gallons of water transferred into the bay, the sliver of a dike was growing to the point that we could start to put equipment back on it. And what seemed like an extremely far-fetched Phase II started to seem possible -- maybe even probable. 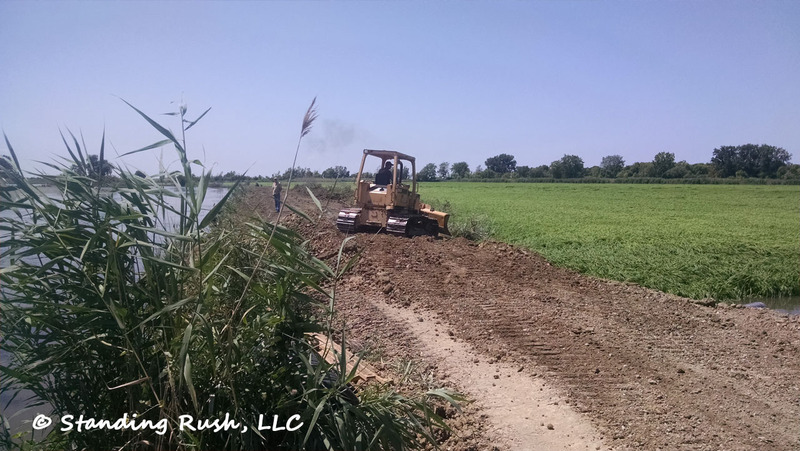 When we first identified the dike project to be priority one, Roy brought up another significant management opportunity that could present itself as a tremendous companion project if we could take all or most of the water off the Rest Pond. I wouldn't even say it was part of our management plan early on, because it seemed like the earthwork itself was a pretty sizable challenge and a second phase would be a longshot -- at least within the same management season. But if we could draw down to "mud" (exposed sediment) over all or most of the 40-acre Rest Pond, we'd be exposing a richly organic substrate that could serve as the foundation for an entirely new explosion of (hopefully) desirable vegetation. I say "hopefully" desirable because the mud of a marsh holds many secrets. There is a lot of history in that deposition, and the seeds that lie in wait (the "seed bed") are the biggest secret of them all. Would a drawdown mean a proliferation of annuals and native perennials (seed-laden to attract and energize, among other things, hungry ducks)? Would an exposed mudflat become nothing but cottonwood saplings? (The blizzard of "cotton" carrying seed in early June made that outcome feel very real.) Or would the seeds formerly entombed under 3-4' of water dominate but be nothing but Phragmites and purple loosestrife? With a site like ours, the answer would likely be a combination of all of the above -- but if we were to wager a bet, our money would be more on invasives than on desirables. So we needed a way to stack the deck. Enter Phase II. If a significant portion of the 40-acres of the Rest Pond could be exposed, Roy proposed a tactic that he has employed successfully many times before, in large part to combat the unknowns identified above. His proposal: introduce Japanese millet. The real magic comes when you consider what is happening when literally thousands of ducks are using the millet -- as they were, day and night, from late August into October and even November. The millet clearly offers highly sought-after food, particularly early in the migration of waterfowl. But while these birds are feeding and roosting, they are also passing other desirable species through their digestive tracks. (If they are eating it, chances are very good that we want it growing in the marsh.) By carrying seed from surrounding habitats and then expelling them into the 40-acre unit, the ducks are unknowingly seeding our marsh. It's a picture-perfect example of nature's circle of life. In essence, a millet seeding provides a dual purpose. 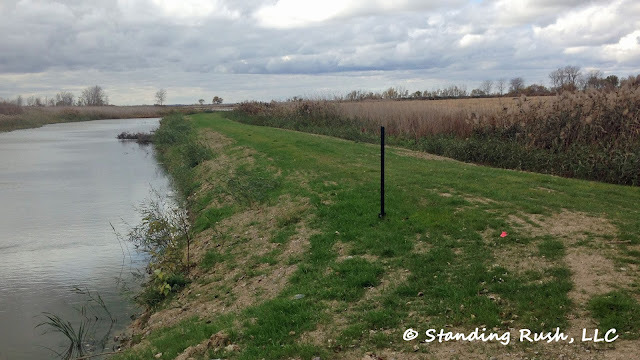 Not only does it provide near instant cover that outcompetes invasives and other undesirable plant species (our management unit was 12"+ within 21 days of seeding), it also serves as an attractant to a broad array of waterfowl and other wildlife. A dense network of subsurface roots instigates a profound change in the water itself. What was literally as brown and cloudy as chocolate milk in April (prior to drawdown) is gin clear by autumn. By September, the stability of the water column was so profound that a hunter could easily see his boots when setting decoys in water that was waste deep. 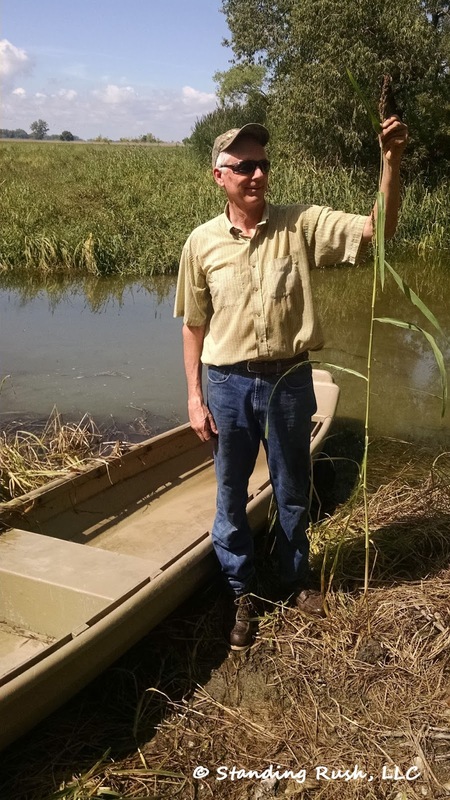 This improvement in clarity not only helped the early development of desirable perennials like cattail and soft-stemmed bulrush, it also most assuredly attracted a new diversity of macroinvertebrates, fish, and other underwater fauna. What is perhaps most exciting about this story is that it continues to unfold. 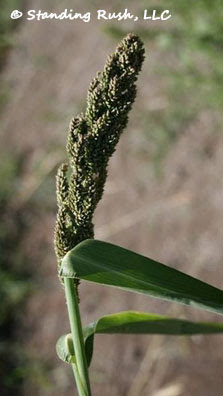 Millet is so prolific in terms of seed production that we anticipate 25% of the unit or more to reestablish as millet in 2017. However, with water levels again drawn down, we are eager to see what gifts the ducks have delivered! As the video below demonstrates, carp proved to be one of our biggest allies in our efforts to completely drain the Rest Pond. We calculated that we would need to drain somewhere between 1-1.5 million gallons of water to completely expose the sediment to allow for millet seeding across the entire unit. By June 10, 2016 the pump had seemingly done about all it could do -- approximately 20 acres were exposed with another ~20 acres in the middle still holding 12-18" of water. 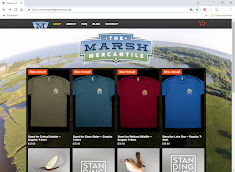 If it weren't for the several thousand carp in the remaining basin -- and their incredible determination to pursue moving water -- we never would have been able to empty the unit. Roy sat patiently over the next two sweltering days, turning the pump on and off as the carp bore a channel up to 18" deep to the pump. By the morning of June 13th, the basin was virtually empty and the plane was flying on millet seed. Our millet maxed out at 7-9' tall, fairly close to the maximum height referenced in the literature for the species. 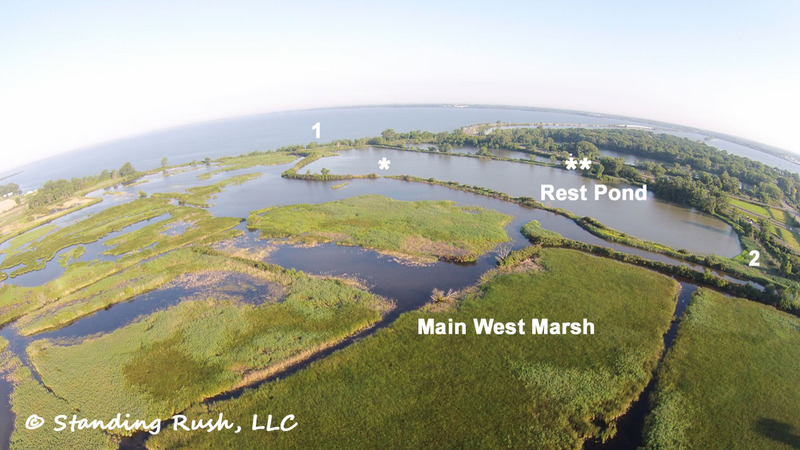 Remarkably, there was a stretch during the summer when heat and humidity coupled with a slow trickle of water from the adjoining south unit (the Main West Marsh) was producing growth exceeding an inch per day. Most vertical growth was complete by the end of August. At 9-feet tall, that works out to 108" of above ground growth in 10-12 weeks -- or 1.3 to 1.5" of growth per day from the moment the seed touched the soil. That's remarkably fertile soil and an equally remarkable growth rate!